If you’re headed to the store to buy Champagne for New Year’s Eve, there are a lot of choices. Where should you start? We’ve written a lot about lower-cost sparkling wines like Asti Spumante, Cava, Crémant and Prosecco. Our Top Pick Of The Week is Yellow Tail from Australia. All are delicious bubblies, worthy of toasting the new year. But if you want to toast the New Year with Champagne, here are some money-saving tips. There are two categories of Champagne: vintage and non-vintage. By law in the Champagne region of France, a vintage year can be declared only when the grapes contain a specific level of sweetness, which varies from year to year. Even in a given year, the sugar levels (called brix) can vary from vineyard to vineyard. With a vintage bottling, the year will prominently appear on the label. Otherwise, no year is given, and the Champagne is nonvintage. A vintage year means that all the grapes used to make that wine came from that particular year’s harvest. For a classic toast: a flute of Champagne. Photo courtesy Champagne flute. 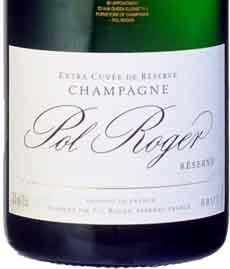 Vintage Champagne represents only about 10% of the total production of the region. On average, producers will declare a vintage in three out of every ten years. Each producer declares for its own house; there is no “regional decree.” In great-weather years, almost every house can declare a vintage. When no vintage year is declared, the Champagne is known as nonvintage wine, although a more accurate term would be multivintage, since wines from different years are blended to create the signature house style (le style de la maison, a consistent taste from year to year). Nonvintage Champagnes are not inferior to vintage ones; they’re just different. 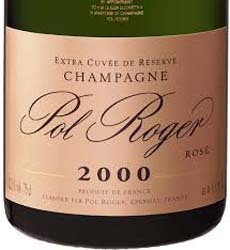 Of the Champagnes shown below, Pol Roger (puhl roe-ZHAY) nonvintage is about $40 a bottle. The current vintage on store shelves, 2006, sells for more than $100. Big difference! This is due to key factors in both marketing and production. The first is supply and demand. There are more than three times as many nonvintage years as vintage years. Vintage bottlings are considered more prestigious, creating greater demand. Production factors also justify the higher price for vintage Champagnes. 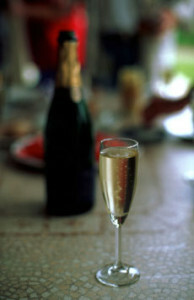 For nonvintage Champagnes, the law requires a minimum aging time of 15 months after the commencement of the second fermentation (where the bubbles are created by added yeast that eat added sugar). For vintage years, a minimum of three years of aging is required. However, in vintage years, most Champagne houses will age their wines even longer. Riper grapes have longer aging potential; aging develops more layers of flavor and complexity. The wine still needs to age after it’s bottled (see the next section). It costs more to finance and manage the inventory, and that expense is reflected in higher prices, along with supply and demand. Vintage Champagnes typically need to be laid down for at least 10 years, and ideally for 15 or 20 years, to develop their great nuances. The vintner constructs the wine to last for the long run. While the vintage wines can be drunk when they’re released for retail sales, knowledgeable buyers don’t plan to drink a current vintage anytime soon. Nonvintage wine, on the other hand, is ready to drink as soon as it is released. Yes, it will develop more with a few years of bottle aging, but don’t hesitate to pop the cork right now. Smaller Champagne houses don’t spend money on marketing and cost less than the “name brands.” However, a Champagne you’ve never heard of can be even more delicious to you than the brands you know. A number of years ago, on a recommendation from wine expert Robert Parker, we purchased and went crazy for a $35 bottle of Egly-Ouriet, a smaller producer we’d never heard of. Most buyers have still never heard of it, and it remains very well priced. You may find that “unknown” Champagne houses—Betrand Devavry, Jacques Selosse, Paul Dethune and Vilmart, for example—are sparkling treasures. If you have style preferences—for example, if you prefer a fuller bodied Pinot Noir-based Champagne rather than a lighter “blanc de blancs” made only with Chardonnay grapes—let the wine clerk make a recommendation. Only Champagne connoisseurs—those who drink a lot of it and have the expertise to analyze what they’re drinking—can tell you if a glass of Champagne served blind holds a vintage or a nonvintage. We still remember when we were taken to dinner years ago, by a Wall Streeter who ate and drank “the best” almost nightly. He ordered a bottle of vintage Veuve Cliquot, but the waiter returned with a bottle of the nonvintage and apologized that they were sold out of the vintage. My friend scoffed and snorted at the thought of nonvintage Champagne, and chose another brand with a year on the label. Net net, a little learning is a dangerous thing. If you like Veuve Cliquot, you like vintage and nonvintage alike. If you know what you like and want to save money, buy the nonvintage version. If you don’t know what you like, ask the wine clerk to point out the great values.